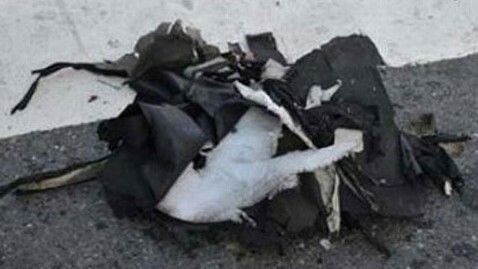 A new security bulletin from the FBI showed images of one of the mangled, partially exploded "pressure cooker" bombs from the Boston Marathon explosions as well as a shredded backpack in which the bomb was reportedly hidden. The unclassified bulletin was sent Tuesday evening to law enforcement agencies across the country and said that the bomb inside the backpack was an "improvised explosive device (IED)" made out of a common pressure cooker. 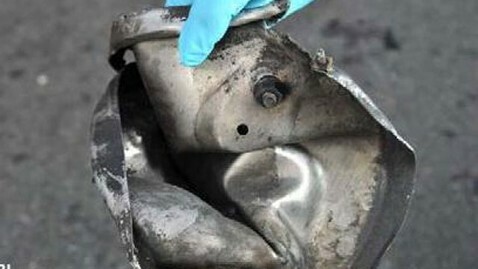 ABC News had previously reported that law enforcement recovered mangled parts of a pressure cooker bomb that included wires, shrapnel and a circuit board. The advisory said there was "insufficient evidence" to determine if the second explosive, which was also hidden in a backpack less than a block away, was made from a pressure cooker as well. Authorities have not yet determined the fusing system for the devices or what exactly set them off, the advisory said. The blasts erupted at approximately 2:50 p.m. EST near the marathon's finish line Monday afternoon killing three people - including an 8-year-old boy - and injuring more than 170 others. Authorities have no suspects in the case and no group, domestic or international, has taken responsibility for the attack.